Apricot jam has to be my all time favourite jam and one of the added bonuses of a summer holiday in France by car is that you can buy fruit by the crate in the supermarkets and bring it home to make enough jam to last all year. I bought a 5 kg crate of apricots for the equivalent of just over £6 and it’s so easy to make it into jam that looks and tastes as good as Bonne Maman jam. 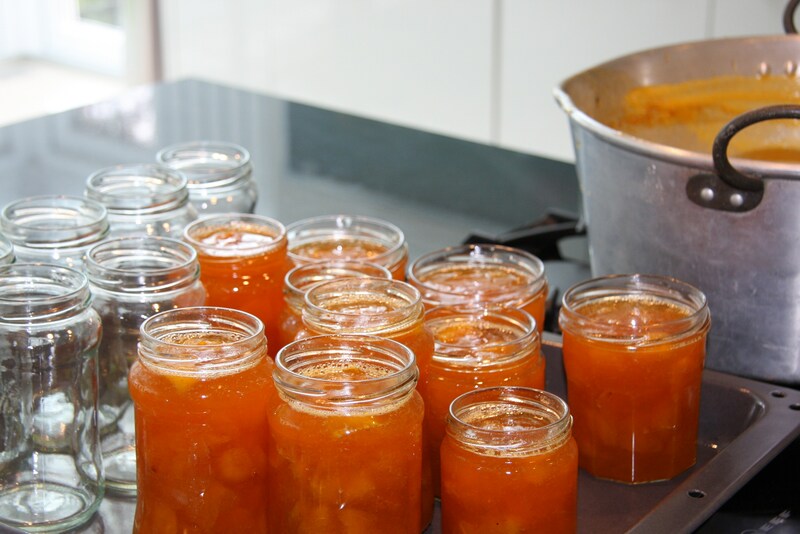 For apricot jam you need the equivalent weight of fruit to sugar, so for 1kg of prepared fruit you would need 1 kg of sugar, plus the juice of a lemon. The lemon juice helps it set and also makes it clear and bright. Prepare the apricots by removing the stones and chopping them roughly. In a large pan over a low heat allow them to soften and release their juice. Once you add the sugar and lemon juice they won’t soften any more so the amount you cook them first will depend on how you like your jam. When the fruit is ready, add the lemon juice, increase the heat and stir in the sugar. You then need to bring the jam to a rapid boil and after a few minutes start testing it for a set. I like a relatively soft set so keep testing it until it is how you like it. You can put a drop onto a cold saucer (stick one in the fridge when you start cooking) and if the jam forms a skin and when tilted forms a drop, it is starting to set. When it is ready, turn off the heat and leave it for a few minutes. You can skim off any scum at this point. You can either buy jam jars or just save up all the glass jars you use – they need to be properly clean and put into the oven at about 180°C while you are preparing the jam so that they are sterile and so that the hot jam does not crack them. Take them out a little before you are ready to fill them as if they are too hot when you put the jam in it can boil up and the fruit floats to the top. You can fill the jars using a pyrex jug or pour the jam using a jam funnel. The hot sugar is obviously very dangerous so be careful not to splash yourself. Put the lids on tight and leave to cool. I think apricot jam is perfect with homemade bread, great as a filling in cakes, as a sauce with icecream and meringue and any other use you can find for it. And as much as I love it I couldn’t eat the lot in a year so luckily homemade jam also makes a great gift!